Despite considerable challenges, Lebanon’s economy has made solid gains. But the government elected on June 7 will need an appetite for reform. The most important characteristic of the Lebanese is their will, determination and capacity to adapt and adjust,” says Prime Minister Fouad Siniora. Few would disagree. The crisis that swept the international banking system last September and October, prompted by the collapse of Lehman Brothers and widespread fears about bank stability, led to a global crisis of confidence that has tipped much of the developed world into recession. With a banking system that is of disproportionate importance to the economy – the sector accounts for some 65% of the Beirut stock market, while deposits in the 65 commercial banks stand at around $94 billion, or 330% of GDP – the mood in Lebanon should have been anxious. With Norwegian production now passed its peak, oil and gas output is expected to drop rapidly within relatively few years, combined with the absence of major discoveries over the last decade, this will present a considerable challenge for maintaining value creation and a sustainable level of activity on the Norwegian Continental Shelf. The remaining resource potential is large but will this decline be adequately met by the commercialisation of many smaller finds in mature areas of exploration? Opportunities for future output growth rest primarily on large new discoveries but this is an unlikely prospect at best. In light of this reality how is the Norwegian oil industry seeking to manage its decline? Nuevo Leon already among the most dynamic economies in Mexico, and has been at the forefront of applying R&D, innovation and science and technology, with a population of just 4.3 million, the state commands 7.6% of Mexico’s GDP and exports some $17 Billion USD per year. With a GDP per capita more than double the national average the state has been at the vanguard of an aggressively coordinated shift up the value-chain and is now host to some 2,000 foreign companies now established in its booming metropolitan area of Monterrey. FOREX trading has a reputation for high-risk, exclusivity and was historically seen as the playground of banks, corporations, hedge funds and other citadels of capitalism, picture foreign-exchange traders and you probably imagine over-paid, over-excited young men in some giant dealing room, all shouting into multiple phones.These days though, you don't have to be a city-slicker to make great profits from the currency markets. With little more than an internet connection and small trading account, pretty much anyone can be a FOREX trader. Barack Obama - One of US? It still feels strange saying it: The son of a Luo goatherd (who went on to become a Harvard-educated government economist in his native Kenya), is now the president of the United States of America. Barack Obama is a son of the continent his African roots are both personally deep and politically significant, a man who knows Africa from the ground up. His inauguration as the 44th president has been hailed worldwide as a remarkable watershed in America’s history, but nowhere are the expectations of him more stratospheric than in Africa. 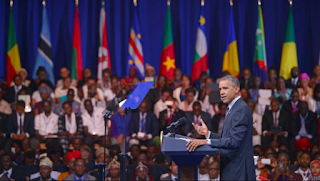 From an African perspective, the power of Obama lies in the symbolism of his election. The shift in people’s perception of what is possible has already had enough positive effect for Obama to never lift another finger and still be declared a success. The United States of Africa - Pipe Dream, or the future of the new African economy? Those words written first in 1924 by the activist and poet Marcus Garvey, gave voice to the socio-political world view which seeks to unify native Africans and indeed those of the African Diaspora as part of a, “global African community” The dream of achieving a politically United Africa. 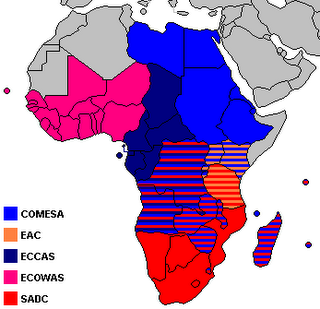 “The United States of Africa” is the name sometimes given to one version of the possible future unification of Africa as a national and sovereign federation of states similar in form to the United States of America. How will the Global Financial Crisis Effect Africa; a blessing in disguise? “They say that when America sneezes, Europe Catches a Cold, Asia develops Pneumonia and Africa’s Tuberculosis gets worse. This is what we are beginning to see”. The former United Nations Secretary General Kofi Annan has said that Africa was facing the equivalent of a “Tsunami” and Dominic Strauss Kahn of head of the International Monetary Fund, told a conference in Dar-es-Salaam Tanzania on March 17th, “The crisis has turned worse than even our relatively pessimistic forecast”. Despite all of this apocalyptic doom and gloom, the Economist’s World growth league table for 2009 is predicting that Sub-Saharan Africa (SSA) will perform better than other emerging markets. Fully 15 of the top 20 top-performing economies in 2009 are in this region, led by Malawi and Angola and indeed several African Nations will buck the global trend and experience a pick-up in real GDP growth. Freelance writer specialising in emerging market, business, macroeconomic and political analysis . 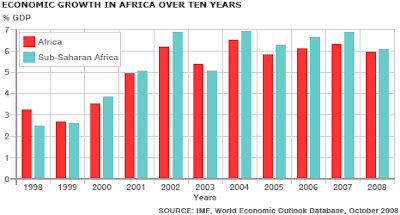 Africa and the Global Financial Crisis; a blessing in disguise? Barack Obama: One of US? or the future of the new African economy?